It is language, more particularly than anything else that distinctly separates man from the rest of the animal world. At one time, it was common to distinguish man as a thinking animal, but we can hardly imagine thought without words. To go a step further, more recently, man has often been described as a tool-making animal; but language itself is the most distinctly identifiable tool the man has invented, and is the one that makes all the other activities/functions possible. The above would make us clearly realize that language is the base and basis on which all human drama is enacted. In a nutshell, language is the foundation on which all the superstructures of civilizations are built. Communication being the cornerstone of any culture, continuity and resurgence of a particular culture would invariably be determined by the clarity and structured composition of its language. These two standards should be reflected in all the components of a language. Moreover, a language is primarily a signalling system that operates within symbolic vocal sounds, with a further signalling system to correspond with these vocal sounds. These written symbols are referred to as the alphabet. Its study, therefore, with the distinct sound and shape of each character of the alphabet, should be given pride of place in any primary education. These are the rudiments of a language. Although the introduction of this essay appears to be rather extensive, its purpose has been to drive home the fact that the countrys educational tradition revolving around the monasteries/temples, laid much emphasis and importance on the said rudiments of the Sinhala language. It is in this context that Cumaratunga Munidasas "Purana Sinhala Akuru Karanaya" comes to the centre stage of any study of the Sinhala language. The meaning of "Akuru Karanaya" or "Akuru Kireema" ^wl=re lrkh$ wl=re lsøu) is "teaching of letters and reading". So the meaning of the book may be rendered as "Ancient or Traditional teaching of Sinhala Letters and Reading". When monasteries/temples were the seats of learning, the books used at the lowest levels of language education were "Hodiya" ^fydah - Sinhala Alphabet), "Nam Potha" ^k fmd;&" "Mangul Lakuna" ^uù=,a ,l=K& and "Sakas Kata ^ilia lg& - Traditionally referred to as "Sakaskada" ilia lv& Anyone who would not be acquainted with these elementary readers were not considered as having a grounding of Sinhala. A further elaboration of Sakas Kata ^ilia lg& would connote that this book is for "putting into good order/condition/arrange/ prepare/mend ones mouth to read Sinhala, clearly and competently keeping to me age-old norms of elocution. The same principles would apply to other languages too. The Sinhala Akuru Karanaya, in addition to the aforesaid five books, add ¤wl=re ieye,a,¦ (Akuru Sehella) and ¤mo ieye,a,¦ (Pada Sehella). The traditional anthology of the basic Sinhala readers contained "Gana Devi Sehella" ^.K fo ieye,a,& But Cumaratunga considers it as a reader full of flaws in the language and also containing ideas detrimental to the springing-up of heroic thoughts. Instead, he composes "Akuru Sehella". Also, in this same manner, he replaces "Vadan Kavi Potha" ^joka l fmd;& with "Pada Sehella". Seheli ^ieye,s& are poetic compositions with short metric verses. Launching these books for the Sinhala readership, Cumaratunga Munidasa states succinctly that "the ancients did not apply these books for mere foolishness. Are they to be blamed if the moderns faulted in the selection of books, systems and achieving of results". (a) Rearranging the Sinhala alphabet according to their shape/form (morphic presentation). The child would thus become familiar with the whole set of characters having almost the same form. For eg: o-|-w-wd-we-wE- have been grouped together. (b) For ease of pronunciation, while showing some words in their original form, they have been rewritten, using Singhala vowel signs. ^ms,s}ms,a,a&. For eg: jD;; written as jD;a; and written as wNahdi. This approach enables children to pronounce/write such words without being in doubt on their correctness. This is in short Sinhalafying of Sanskrit words that appear in mixed Sinhala writings. "Nam Potha" ^k fmd;& the basic reader providing a list of names of villages-towns-temples and other places of importance, has been expanded by Cumaratunga, thereby providing more information, a child should be aware of. Names of me guardian deities of the four quarters - the Traditional Guardian Deities - Lords of the Eight Directions - the Six Celestial Worlds (Abodes) - Sixteen Brahma worlds - Eight Chief hells - Names of Sinhala Kings and Queens - names of Scholars (both Monks and Laity) - our Mountains and Rivers - old and new Villages - are the additional information provided. He concludes this exhaustive list with some names of males and females. The objective of his approach is to make the child aware of this basic information, and widen his horizon of knowledge. "Magul Lakuna" ^uù=,a ,l=K& is an unommitable partner to any such compendium. 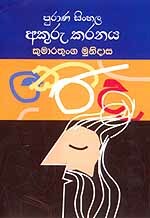 It is undoubtedly a book one must read if he is to condition himself and read with consummate ease any Sinhala reader. To make reading more lucid, the traditional reader "Sakas Kata" ^ilia lg& has been included. This book has been coming through the ages, as "Sakas Kada" ^ilia lv&á the meaning of which is incompatible with its objective. Hence, Cumaratunga boldly revises its name as Sakas Kata ^ilia lg& which means conditioning/mending ones mouth for reading. By its size, Sakas Kata is a booklet, and it is doubtful even one in a thousand amongst us could read it with ease. Here too, the late scholar has facilitated the reader by rewriting Sanskrit words using Sinhala vowel signs. are the letters, and (therefore) do not part with them. are the poets, honoured by the country"
Akuru Karanaya ends with the following verse specifically aimed at Children, to get more and more closer to letters, if they are to prosper in life in the future. Pada Sehella is a short versified composition containing 26 verses. It is stated that although Cumaratunga wished to write Pada Sehella to replace the Vadan Kavi Potha, he had not been able to do so. The Pada Sehella contained in this compendium is the latest composition that had appeared in the Swadesha Mithraya newspaper, of 21st and 28th November 1936. Herein basic rules of Sinhala grammar have been explained concisely and lucidly. The main intention of the Scholar has been to make the reader aware of the more important and salient aspects of our grammar, so that at later stages, he would be equipped to gain a more comprehensive and detailed knowledge. This is in short a foundation course in Sinhala Grammar. All these Cumaratunga has done within a very limited frame of 26 short verses. It has been universally accepted that the child is more attracted to verse than prose. This means, Cumaratunga has exploited to the full. Experiential learning has proved that "verse" is the most effective medium to teach children. They initially get carried away by the tune, and knowledge is slowly crept into them. All the six books included in mis compendium under the title Purana Sinhala Akuru Karanaya cover six major facets of our grammar. It is therefore an invaluable treasure for every home - every school library and even for scholars, as it enables/facilitates to look at our language beyond the traditional paradigms. Although written six to seven decades ago, the book reflects Cumaratungas advanced thinking, and his sniffled approach, based on independent thinking. It becomes a marvel when we consider that, this period was yet to experience even the rudiments of modern teaching methods. The essay would not seem comprehensive if a comment is not made on the quality of printing of this compendium. Quality of printing of the books has done justice to the quality of its contents. Clear printing on quality paper and the colourful and attractive cover would, for certain, enhance its value. In conclusion, I do not hesitate to say that both the Cumaratunga Munidasa Trust and the Visidunu Prakashakayo (Publishers) deserve unhesitant commendation; The objective of the book being to uplift the standard of Sinhala, and create a generation with a solid language-base. Love for the language is the base and basis for loving ones community and the country.